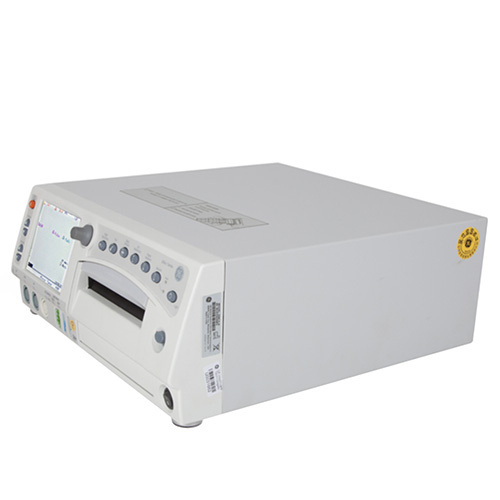 The GE Corometrics 259cx is a maternal/fetal monitoring system. 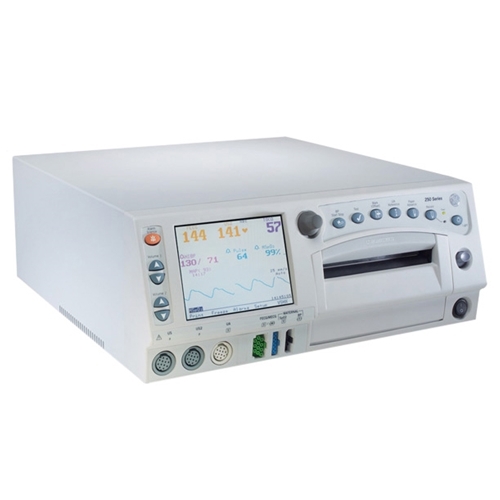 This unit is a full antepartum/intrapartum fetal monitor that includes innovative features that help clinicians deliver a high-quality birthing experience and enhanced patient care. The Corometrics 259cx monitors uterine and fetal activity including fetal heart rate, and has enhanced maternal monitoring features including temperature, oxygen saturation, ECG, and non-invasive blood pressure. This Corometrics Fetal Monitor provides a comprehensive perinatal monitoring and the flexibility and convenience that give you instant access to the detailed information you need during labor and delivery. Having that information readily available helps you provide a positing birthing experience for the mother and baby. 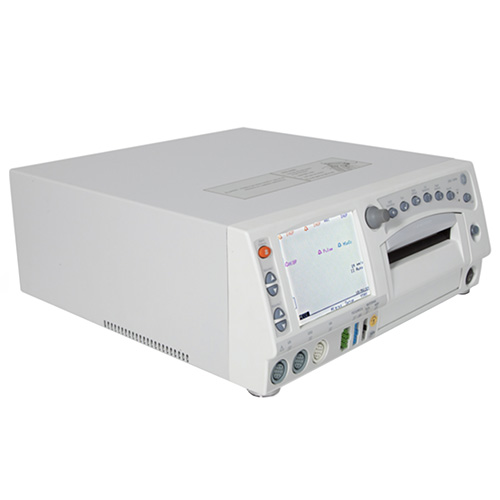 The Corometrics 259cx is a medical device for monitoring maternal/fetal parameters. This monitor is equipped with a color LCD display which provides simultaneous display of fetal and maternal parameters plus the maternal waveforms. On the right side of the front of the unit is the recorder. The recorder prints continuous trends and alphanumeric data on one strip chart. The system is compatible with Centricity Perinatal Clinical Information Systems and other information systems to streamline, capture, and archive patient data. The 259cx supports two fetal heart rate (FHR) channels, Uterine Activity (TOCO or IUP), maternal non-invasive blood pressure (NIBP), maternal pulse oximetry (MSpO2), fetal ECG (FECG), and Maternal ECG (MECG). 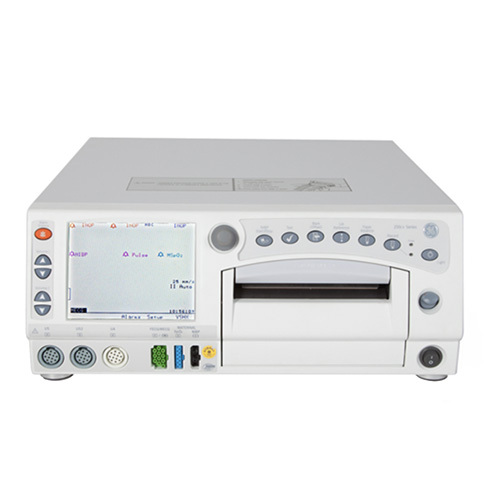 The back of the Corometrics Fetal monitor is equipped with many input and output ports for inputting and outputting data and power. You have a Telemetry Connector, Data Entry Connector, Nurse Call System, Central Systems Connector, External VGA Connector, Communication Connectors, ECG Out Connector, Fetal Acoustic Stimulator Connector, Remote Event Marker Connector, and a Power Inlet Module. When powering up the Corometrics 259cx Fetal Monitor, the unit automatically performs a number of tests to verify the integrity of the system memory, processor, and voltage levels before allowing the monitor to enter a normal operation mode. The pulse oximetry module is also tested and automatically calibrated upon power-up, or whenever the unit is reset. Cuff Inflation: Initial inflation to 135 mmHg; user-selectable from 100 to 250 mmHg. Subsequent inflation approximately 10 mmHg greater than previous systolic pressure. Safety Features: Automatic cuff deflation if the pressure exceeds 315 mmHg, or max. measurement time exceeded (AAMI SP10 limit of 180 sec; set to 120 sec). Safety timer detects microprocessor failure. Auto mode minimum 30-second delay from the end of one determination to the beginning of another to allow for a venous return, indicated by WAIT on the user interface in lieu of automode timer. Questions about our Fetal Monitors? Soma Technology, Inc offers a wide range of Fetal Monitors. If you have any questions about any of our Fetal Monitors or need a quick quote, call 1-800-GET-SOMA and one of our knowledgeable sales representatives will help you. Fetal monitoring is extensively used in birthing facilities for measuring fetal well being and assessing labor progress. Electronic Fetal Monitors are used to detect and trace the fetal heart rate and uterine contractions. These are usually monitored at the same time however, each one can be obtained separately. Ultrasound (U/S Transducer): A transducer is placed on the abdomen to direct an ultrasonic beam towards the fetal heart and to sense Doppler-shifted echoes created by moving cardiac structures. Uterine Activity (Toco or U/A Transducer): Uterine contractions are recorded from a pressure-sensitive device that is placed on the abdomen and held by a lightweight stretchable band or belt. Smart BP works with DINAMAP SuperSTAT non-invasive blood pressure (NIBP) technology to automatically delay blood pressure measurement during contractions. These patented technologies keep the patient more comfortable and help ensure faster, more meaningful diagnostic data. Heart Beat Coincidence Recognition provides visual indications when it detects synchronous fetal and/or maternal heart rate signals, indicating that you may be monitoring a duplicate signal. The monitor compares up to three heart rates and provides an overlapping heart symbol for clear visual recognition and documentation. The ChartLight feature allows the clinician to easily read the fetal strip, while patients remain relaxed in their low-light setting. Backlit keys help caregivers work comfortably without additional illumination and the optional remote display provides further convenience. Song Player allows you to celebrate the birth with a choice of three songs. Fetal heart rate high/low alarms provide both audible and visual alerts if the fetal heart rate (FHR) is outside of the user-defined high/low range. Optional unique Spectra Alerts transform the powerful Corometrics 250cx Series into a “smart” monitor complete with alert functions. You can simultaneously analyze FHR and uterine activity (UA), and notify clinicians of deviations from the norm. Selectable 3-lead maternal ECG with pacemaker detection and rejection generates maternal heart rate, QRS waveform display, and a six-second snapshot printout when requested. Maternal Vital Signs History documents up to eight-hours of maternal parameters, displaying the results in a flowchart summary format for easy charting and reference during recovery.